Benefitting the worthy Nantucket Historical Association, the Antiques & Design Show of Nantucket is always an August highlight on island. With just one more day to visit, I wanted to share a few favorites from this year’s show. 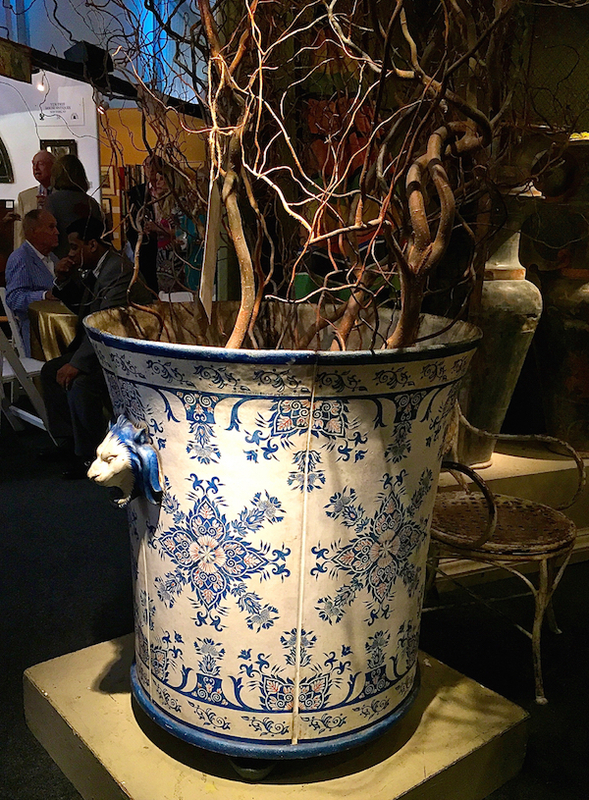 When attending the preview at the opening night cocktail party, both designer Suzanne Tucker (who spoke on the design panel Friday morning) and I admired (and instagrammed) an unusual 19th century cast iron urn in a rare oval shape from the Finnegan Gallery in Chicago. 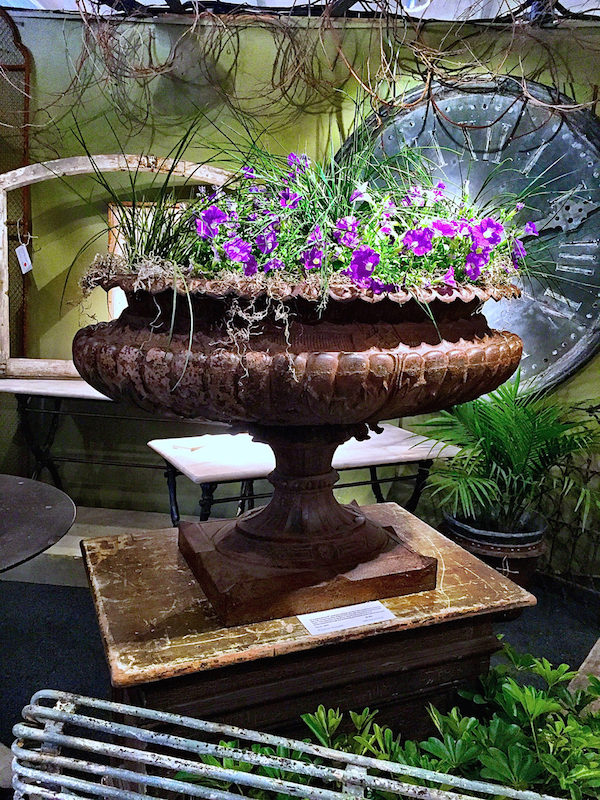 They also are showing an unusually large mid-19th century French enameled cast iron conservatory planter. With lion head handles and lovely blue and white decorative pattern, it would be a marvelous addition to any room. 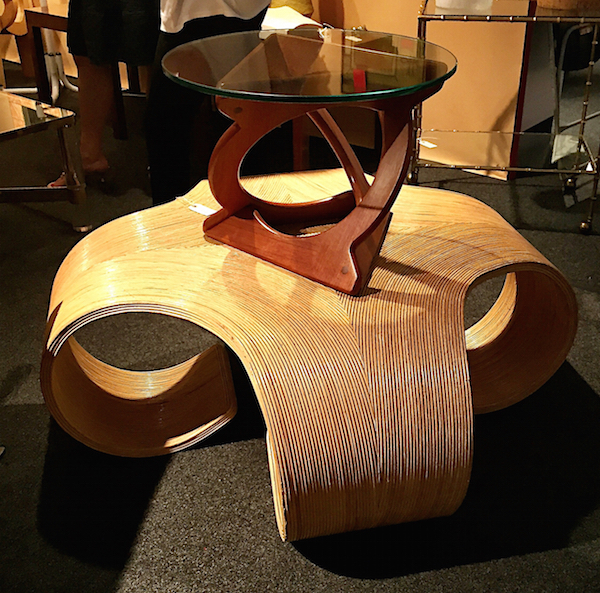 David Bell Antiques of Washington, DC had a booth that stopped most design aficionados in their tracks. Design Panel speaker Matthew Patrick Smyth grabbed a great shot he posted on Instagram, below. as well as a stylish 1970’s Italian rattan cocktail table. Speaking of Italian style, Earle D. Vandekar of Knightsbridge, known for their selection of antique ceramics, always has some great Fornasetti pieces. 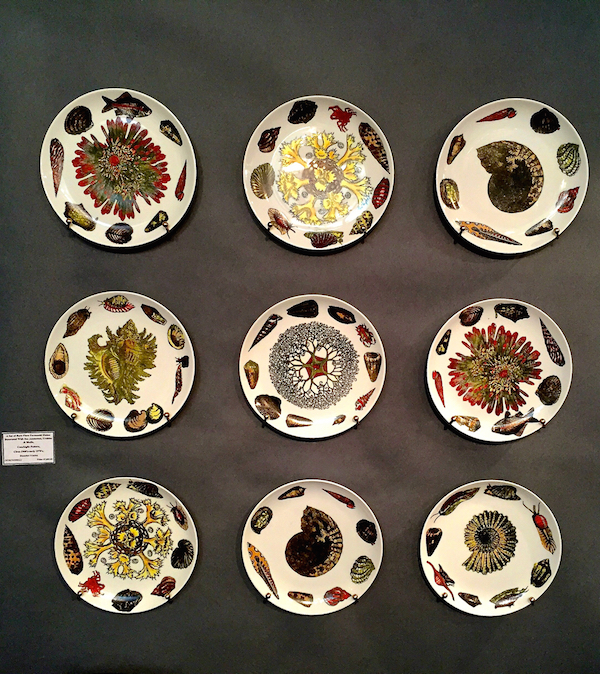 This year they showed a wonderful set of rare Conchiglier pattern plates from the 1960’s – early 70’s, decorated with sea anemones, urchins and shells, perfect for a sophisticated beach house. 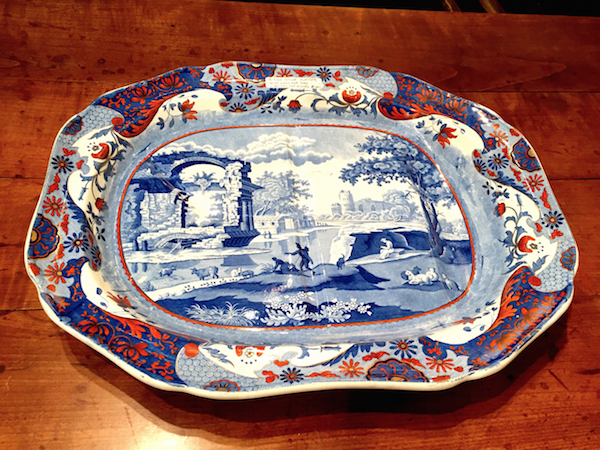 Roger D. Winter, among his selection of fine antiques, showed a fine 19th century Spode platter in an unusual color combination that I have never seen. 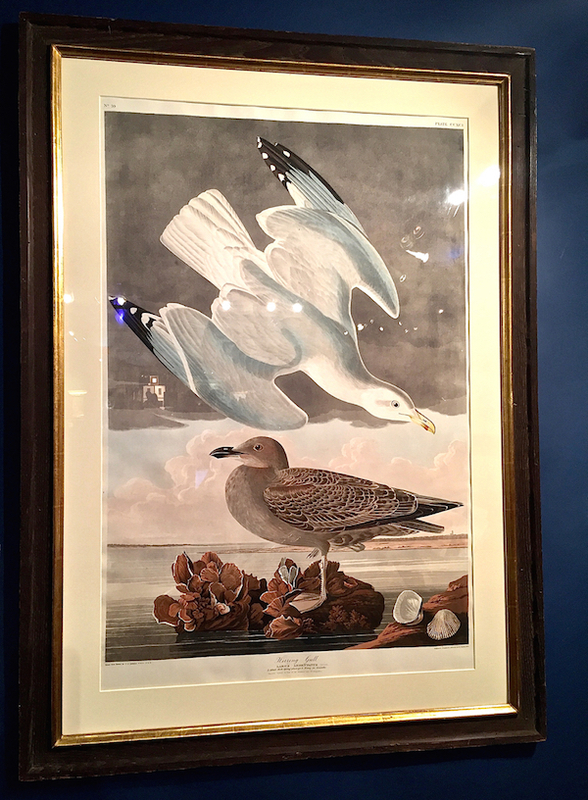 While Audubon prints have been offered before at the show, this year Fine Antique Prints had a beautiful very large original engraving of “Herring Gull” from the famous Birds of America London 1836 volume. Part of the oversized “Elephant Folio,” of which purportedly only 180 completes were made, the print was attainably priced and sold within the first hour of the show. 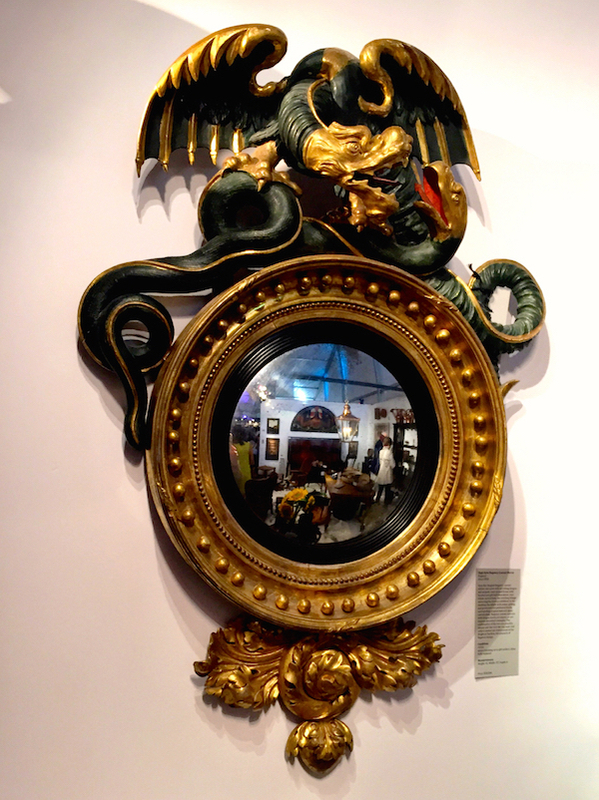 Yew Tree House Antiques is always a favorite, and within their eclectic offerings of furniture, accessories and Mdina glass at the show is a fabulous Regency convex mirror circa 1810. With original mercury glass, water gilding and green and red patinated finished, it is the unusual crest of wrestling dragon and serpent that separates this from the pack. Reminiscent of the fantastic embellishments at Brighton Pavillon, this is a wonderfully decorative and important piece. 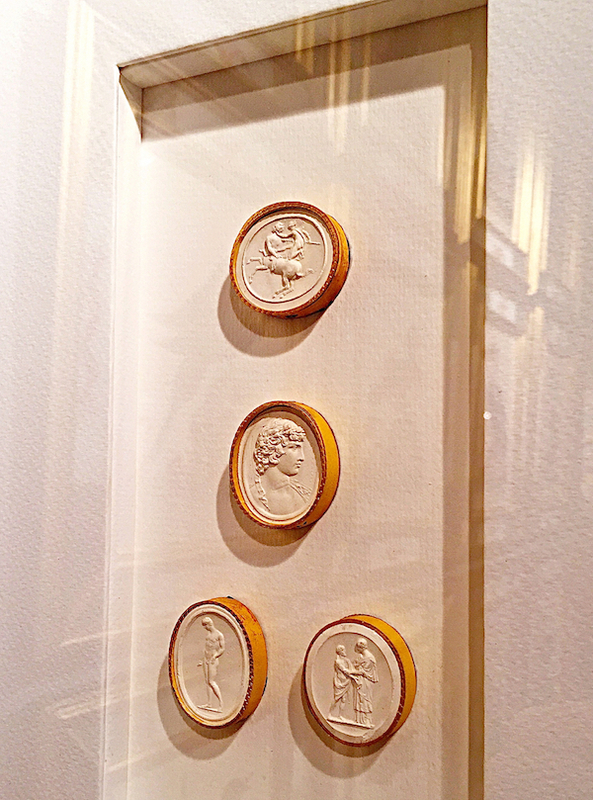 From Dinan & Chighine in London, these intaglios of gems, seals and cameos were produced by the Paoletti workshop in Rome circa 1800. 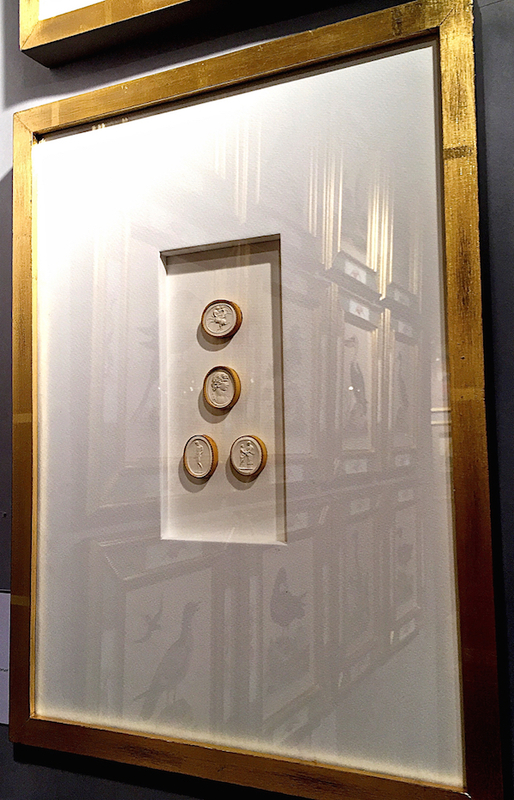 Beautifully set in hand gilded frames, they are a great way of displaying a piece of history. 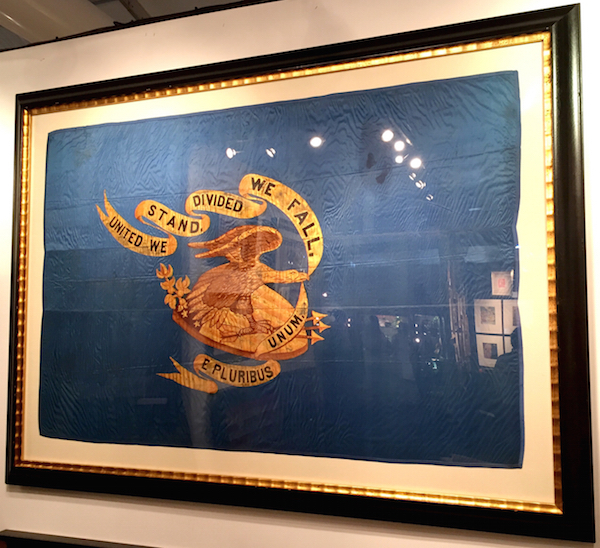 Jeffrey Bridgman is the nation’s largest seller of antique flags and a serious collector and dealer of Americana. 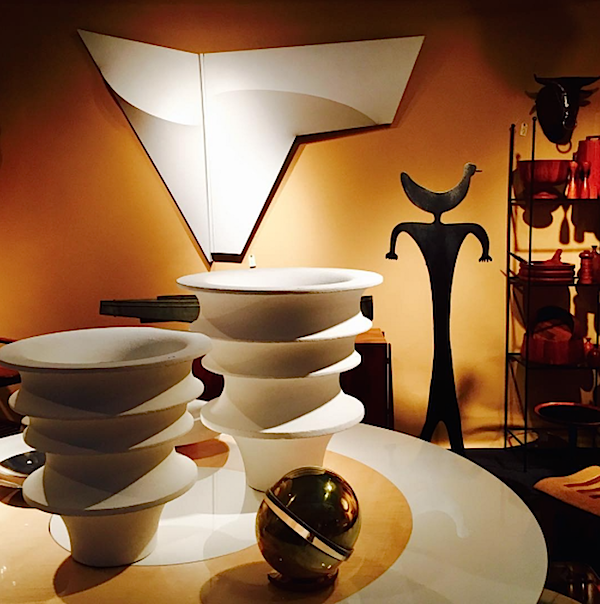 I love his attitude of “Buy the best you can afford and you will seldom be dismayed.” Two of his pieces in particular intrigued me. 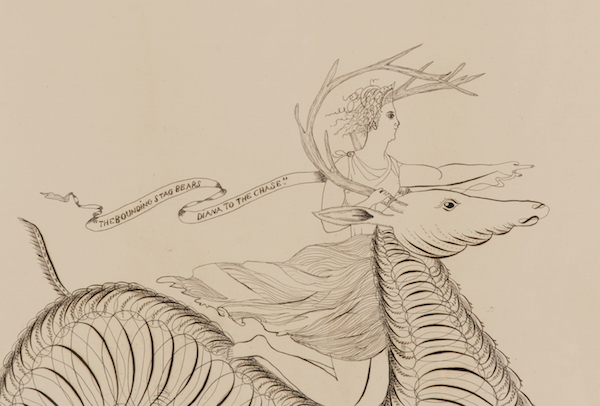 This elaborate calligraphy drawing form 1888 portrays Diana, goddess of the hunt, riding a stag. 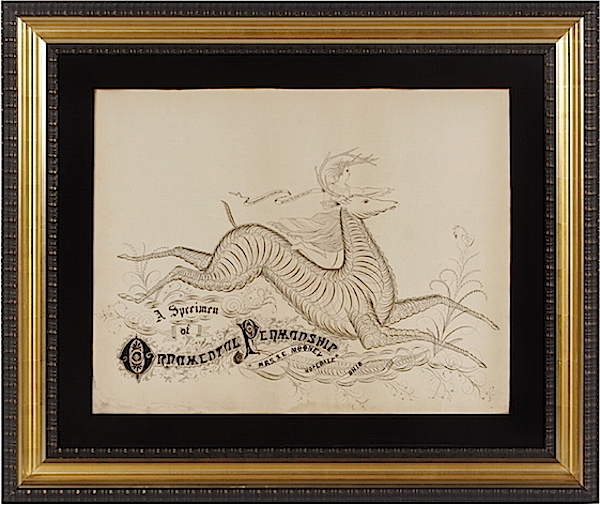 While stags were a popular subject matter for such works, the inclusion of a rider was not adding a wonderful human element to the decorative and detailed art. One of his most spectacular pieces is this enormous Civil War regimental flag. 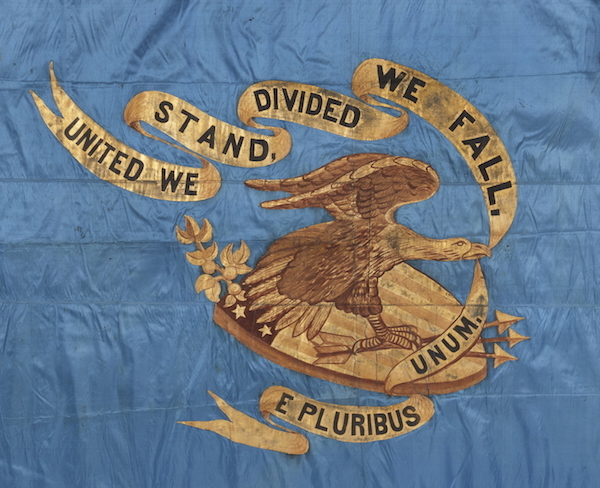 The battle flag of a Civil War volunteer unit, this represents the unit’s own, personalized version of the federal standard and would have been carried alongside their Stars & Stripes. Bridgman is very literate in civil war history and mentioned that he has never seen this now ubiquitous slogan painted or embroidered in its entirety on a flag or other patriotic American 18th or 19th century textile. It seems to be associated with the 35th regiment from southern Ohio, which was, “Southern-leaning and caught in the middle both physically and politically between North and South.” And as amusing side note, the 35th was nicknamed the Persimmon Regiment, after 15 of its members, captured by the Confederate Army three months into its service, chose to find and eat persimmons instead of fight. The fruit turned out to be much admired and by the end of the war, the title was also shared by the 73rd Illinois and the 100th Indiana. This entry posted in art, interior design, travel. 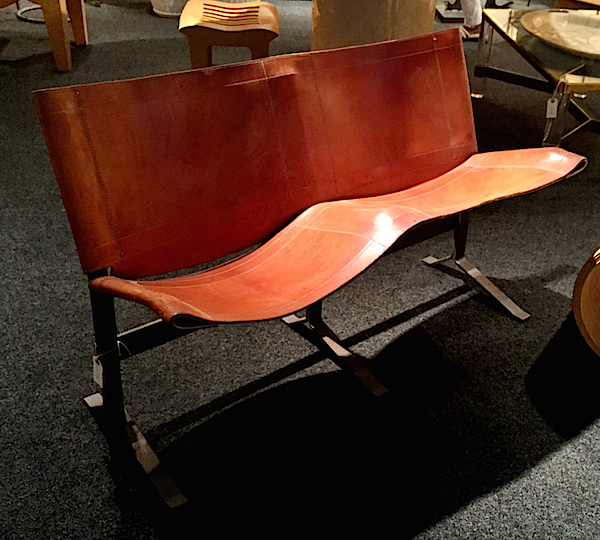 Entry Tags: antiques, Antiques & Design Show of Nantucket, antiques show, Nantucket Bookmark the permalink. Beautiful, I am not surprised that there were some antiques that originated from Chicago. Our city was a huge producer that created beautiful quality items at the turn of the century. I love the bench and the flag too. Thanks for sharing. The intaglios look particularly nice. Crazy for the intaglios. And interested by the Spode platter with red added to the blue and white – I’ve never seen that before. Must be a great show – thanks for sharing! Thanks for sharing. I’m sad I missed it this year.